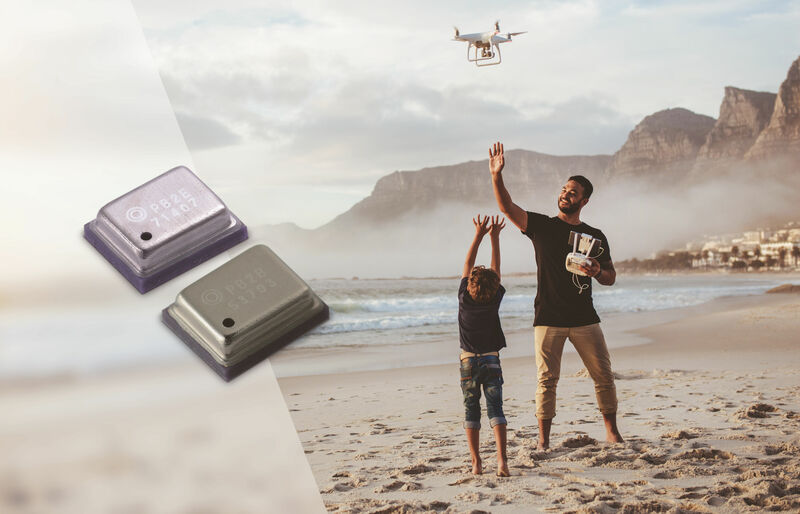 Two new MEMS-based barometric pressure sensors from Omron Electronic Components Europe are specifically designed to support height and pressure measurement in drones, smartphones, pedometers and other battery powered mobile systems. The new Omron 2SMPB-02B and 2SMPB-02E sensors provide stable and reliable height and pressure measurements, allowing changes in elevation of as little as 2m to be reliably recorded. Developed as an evolution of the successful blood pressure gauge, the new sensors have been specifically remodelled for mobile applications and are smaller at just 2.0 x 2.5 x 0.85mm in size. The new barometric sensors measures pressure with high accuracy based on the built-in low noise 24bit ADC and feature digital control and output via I2C/SPI interfaces. Both automatically power down non-working circuits to minimise the power consumption. Individual calibration parameters are stored in One Time Programmable-ROM (OTP), and are retained when the system is powered down. An integrated temperature compensation circuit helps ensure accurate absolute pressure measurements. Both sensors are configured to measure the pressure of air between 30kPa and 110kPa. Maximum pressure is 800kPa and the sensors can be used at temperatures of -40 up to 85 Celsius without condensation or icing. The sensors have a pin layout that is compatible with alternative solutions on the market, simplifying integration. 2SMPB-02E matches the features and performance of the 2SMPB-02B but offers a better level of accuracy down to +/-50Pa. The -02B version is ±100Pa. Applications are extensive and include wearables, tablets, smart phones, drones, altitude meters, car navigation and floor detection.